Sometimes you might not want the page numbers shown in your header or footer to be the same as the actual page numbers of the document. On the Header & Footer Tools Design tab, select Different First Page. In the header or footer area, you should see a label on the first page that says First Page Header. Select the page number to highlight it and press Delete. 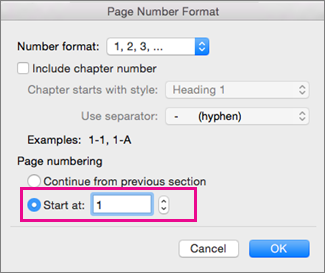 To start page numbering later in your document, first divide the document into sections, unlink the sections, and then insert page numbers. Click in the document where you want to insert a section break. Double-click in the header or footer area where you want to display page numbers. This will open the Header & Footer tab. Click Page Number > Page Number and then choose the alignment and position you want. To start numbering with 1, click Start at, and type 1 (otherwise, Word will use the actual page number). Double-click in the header or footer area of a page in your document. Word opens the header or footer for editing and displays the Header & Footer tab. 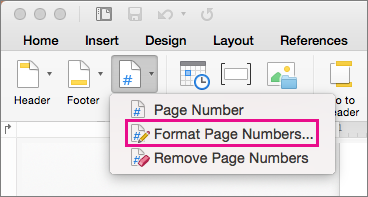 If your document does not already have page numbers, click Page Number in the Header & Footer tab, and then click Page Number. Word displays Page Numbers, where you can select the position and alignment of page numbers, and then click OK to add them to your document. Click Page Number > Format Page Numbers. 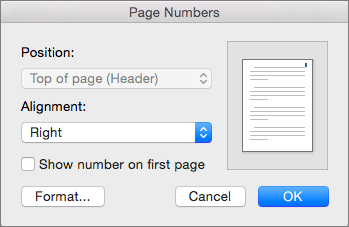 In the Page Number Format dialog box, select Start at, and then type the number you want as the starting page number for the document. To stop editing the header or footer, click Close Header and Footer, or double-click anywhere outside the header or footer area. Click in the section where you want to start page numbering. 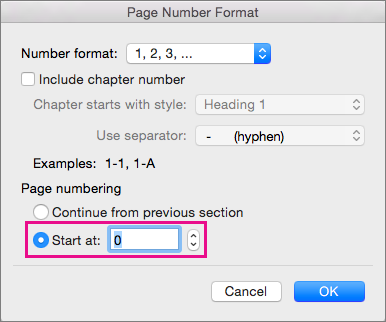 If your document does not contain any section breaks, insert, delete, or change a section break where you want to start page numbering. On the Insert menu, point to Break, and then select the appropriate kind of section break. In the Start at box, enter 1, and then click OK.
You can number each section in a document independently. 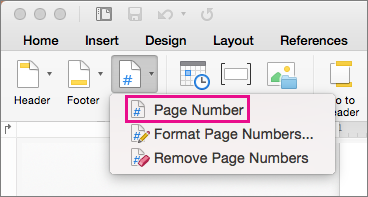 To suppress printing of the page number on the first page of a section, clear the Show number on first page check box in the Page Numbers dialog box. In the Start at box, enter a number, and then click OK. 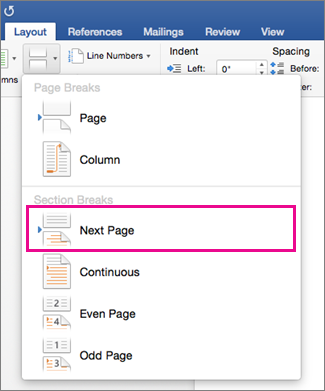 If your document is divided into sections, click in the section where you want to change the starting page number.